HYDERABAD Once upon a time ! : Husain Sagar Tank from Secunderabad. Husain Sagar Tank from Secunderabad. 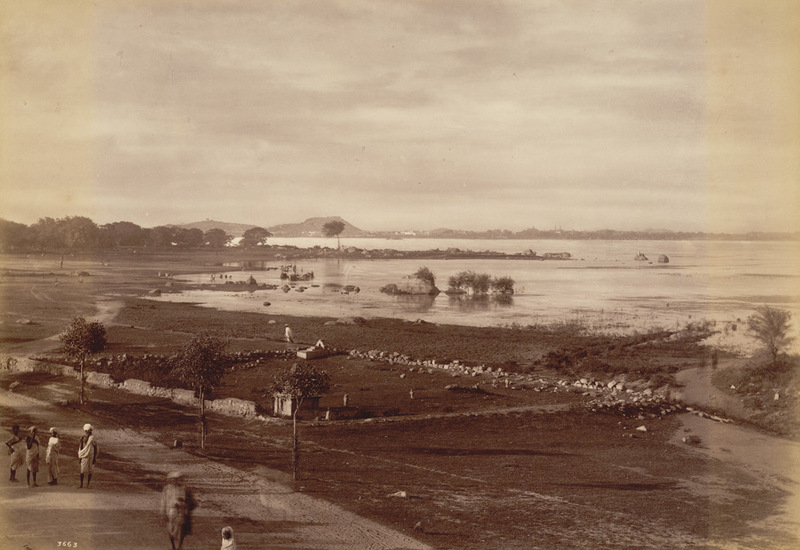 General view of the Husain Shgar lake and shore photographed by Deen Dayal in the 1880s. This is from the Curzon Collection: 'Views of HH the Nizam's Dominions, Hyderabad, Deccan, 1892'. Husain Sagar is an artificial lake which divides the twin cities of Secunderabad and Hyderabad in Andhra Pradesh. The lake was created in the 16th century by Ibrahim Quli Qutb Shah (r.1550-80) and named after Husain Shah Wali, who had helped the sultan recover from illness. It was created by enlarging an existing small stone dam across the valley. The lake supplied the townspeople with water as well as irrigating the surrounding land.